Field Marshal Sir Henry Wilson, an Irishman who in June 1922 was assassinated on his doorstep in London by Irish republicans, was one of the most controversial British soldiers of the modern age. Before 1914 he did much to secure the Anglo-French alliance and was responsible for the planning which saw the British Expeditionary Force successfully despatched to France after the outbreak of war with Germany. A passionate Irish unionist, he gained a reputation as anintensely 'political' soldier, especially during the 'Curragh crisis' of 1914 when some officers resigned their commisssions rather than coerce Ulster unionists into a Home Rule Ireland. During the war he played a major role in Anglo-French liaison, and ended up as Chief of the Imperial General Staff,professional head of the army, a post he held until February 1922. After Wilson retired from the army, he became an MP and was chief security adviser to the new Northern Ireland government. As such, he became a target for nationalist Irish militants, being identified with the security policies of the Belfast regime, though wrongly with Protestant sectarian attacks on Catholics. He is remembered today in unionist Northern Ireland as a kind of founding martyr for the state. Wilson's reputation was ruined in 1927 with the publication of an official biography, which quoted extensively and injudiciously from his entertaining, indiscreet, and wildly opinionated diaries, giving the impression that he was some sort of Machiavellian monster. 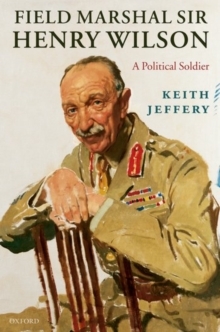 In this first modern biography, using a wide variety of official and private sources for the first time, Keith Jeffery reassesses Wilson's life and career and places him clearly in his social, national, and political context.